The singer joined the band on the Today show to announce she will be joining them on the road for their 2014 world tour. She quit the band in 1998 after 30 years, and revealed it was a fear of flying that made her leave. Christine said: "I had a fear of flying. I hadn't flown for 15 years." 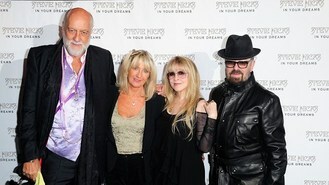 The 70-year-old English musician was joined by original bandmates Stevie Nicks, ex-husband John McVie, Mick Fleetwood and Lindsey Buckingham for the special announcement. Christine briefly reunited with the band back in September for two tour dates at the London 02 Arena. "Walking out in London was sensational," she said. The band revealed they are even working on a possible new album. "I have very high hopes for all of this," guitarist Lindsey Buckingham told the USA Today newspaper. "We've only been in the studio a week, and it's been really beautiful." Fleetwood Mac are rumoured to be headlining Glastonbury festival this summer.